Do you know what “calorie” means? You probably know you want the number to be low, but what does it actually mean? The calorie calculation is based on the number of macronutrients in food. A macronutrient includes carbohydrates, proteins, and fats. The calorie number is then based on the amount of potential energy each macronutrient poses. For example, 1 gram of carbohydrate and protein contain 4 calories, while 1 gram of fat contains 9 calories. Each day, our bodies burn fuel to keep us alive. The more active we are, the more fuel we burn. In fact, our bodies will burn more fuel if they’re in better shape. In a way, our body weight is based on a ratio: fuel consumed vs. fuel burned. Metabolism plays a big part in this since metabolism is the process by which our body converts what we eat and drink into fuel (energy). So, if and when our metabolism slows down, our ability to burn calories slows down. Therefore, when we overconsume what our body can’t convert into energy, that extra fuel is stored as – you guessed it – fat. Please remember calorie count has nothing to do with healthy eating. For those who are trying to lose weight or are trying to eat healthier, counting calories can be somewhat dangerous. Calories do matter – but focus on where your calories come from. Eating clean, whole healthy food is the difference maker in both your weight and your health. Real food without additives can reduce inflammation and the storage of toxins. This directly affects our energy level and drive to stay focused and committed to health and wellness. Clean up your diet and eat food your body was made to burn. Get in the game and don’t be a spectator! The word “carbohydrates” can be scary when it comes to dieting. The two things to remember? Carbohydrates have two main functions – energy breakdown and digestion. Proteins are made up of hundreds of amino acids. Enzymes are proteins that regulate chemical reactions in the body. Your body uses protein to repair and build, especially hair and fingernails. Protein is an essential building block for muscle, bone, cartilage and skin. Proteins also have many more bodily functions. Fats actually do have an important role in dieting. Fats give you the energy, or fuel, to succeed. It also absorbs certain nutrients and helps our cell membranes. While it can slow down the digestive system, good fats add to satiety, or a sense of fullness that can help us avoid overeating. A quick overview would be to eat more Omega 3 fatty acids than Omega 6. This means fewer animal products and more plant-based products. Avoid trans fats altogether. Mono and polyunsaturated fats are better than saturated fats. Remember, saturated fats are usually solid at room temperature. Remember that macronutrients and calorie counting are relatively new to the dining experience. Everyone is different and requires different needs. The goal of your diet should be to give your body the fuel it needs to operate at its highest level. That could mean reducing calories, or it could even mean increasing them! 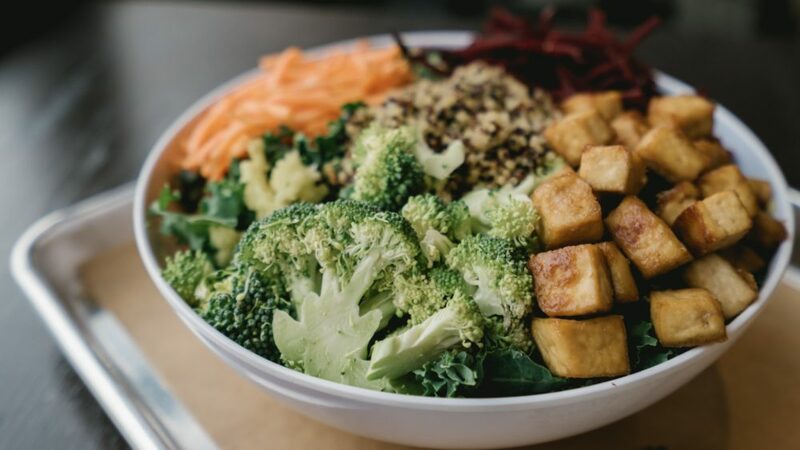 CoreLife Eatery’s goal is to provide various combinations of whole healthy food (that tastes great) so you can reach your optimal performance levels. Whether that’s to run a marathon, workout for an hour, or just get through the day – everyone is different! The “recommended” 2,000 calories a day can be misleading. While some people do require around that amount, it isn’t a “catch-all” suggestion. For a more accurate recommendation, take your weight and multiply it by 14 and 17. Your caloric intake should be somewhere between those two numbers.